A new breed of reflection filter? It filters reflections effortlessly, allowing vocals and instruments to get right up on the mic. The Halo took us straight back to a '70s armchair we loved as a kid: a purple egg-shaped swivel chair which semi-blocked out the sights and sounds around you. Luckily Aston Microphones' Halo reflection filter is smaller and lighter, so it provides little extra challenge to a mic stand. 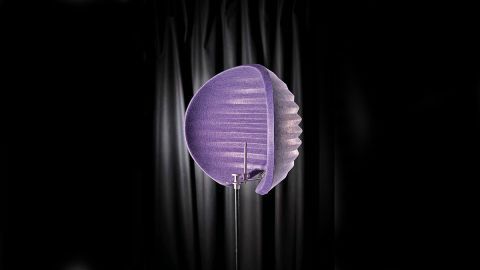 The ridged moulded acoustic absorber material, covered with a coarse felt, is not only light, but remarkably rigid; this makes a change from the regular foam affairs that just collect dust and a variety of vocalists' oral ejectamenta! The metal mounting attaches to the mic stand via a 5/8-inch threaded socket. The slotted mount rail allows the Halo to slide back and forth as well as swivel, while the mic mounting bar, which is effectively static with regard to the mic stand, can be raised/lowered 125mm. The 100mm travel of the Halo along the slotted rail, in conjunction with rotation of the mic mount means a mic can sit well proud of the reflection filter as well as be buried right at the back, depending on how much you need to protect the mic. For mic mount positions heading further into the Halo the available distance from the bottom of the mic to the slotted rail can be an issue for the mic cable and XLR plug, though we found moving the mount to one side alleviated this problem for larger mics. Though reflection filters such as this favour side address mics (large diaphragm condensers and ribbons), there is enough depth and rail room to use end address mics (ie dynamics), though they tend to poke further out of the Halo and reap less of the side-spill protection benefits. The most impressive quality of the Halo is its sonic neutrality. Placing any (semi) solid object close to a microphone, especially those with cardioid and figure-eight polar patterns, tends to seriously affect tonality, whether the intended source is close or at a distance. While working with the Halo we found that it had little effect on the sound of distant sources, just their amplitude when off axis (ie blocked by the Halo). This bodes well for usage in multi-source recordings where tonal (phase) shifts in bleed can really make it hard to balance a mix. Of course the raison d'etre of the Halo is close sources, in particular the human voice. Its effect is two-fold. Firstly the source is absorbed, or not reflected back into the rear/sides of the mic, in a way that appears to limit proximity effect, which allows for an up close address to the mic with less marked LF rise: this was both surprising and pleasing. A closer address of the mic increases the ratio of source to background level, further 'drying up' the sound. The second part of the effect is more obvious in that the Halo protects the rear and sides of the mic from the room, further increasing the ratio of direct source sound to the mic. In a bright room the noticeable loss of sibilant reflections is clear, making mix adjustments a lot easier. In the days of heavy compression, a subtle room sound can quickly rear up as a monster problem. Though the Halo is most suited to vocal usage, we find it works well with acoustic guitar, especially considering the proximity effect behaviour. It is well worth playing with the mic depth into the reflection filter as this can have a 'drying out' effect - a little room helps acoustic instruments live in a mix. The Halo is more expensive than many similar products, so it does need to trade on quality over value for money. The combination of off axis neutrality, seemingly reduced proximity effect and lightweight construction means it does achieve this. If you regularly record in a reverberant space which you can't/don't want to alter, or you operate a mobile recording set-up, the Halo will serve you well.